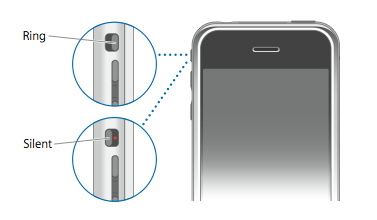 From the top left edge of the device, flip the Ringer switch to turn Silent Mode on (sound is off, switch is in red position) or off . The silent mode/ringer notification briefly appears on screen. If the switch appears to be stuck, remove the case to ensure the switch isn't blocked. For more info on Silent Mode and adjusting sounds and vibrations on your iPhone, check out this Apple Support page.